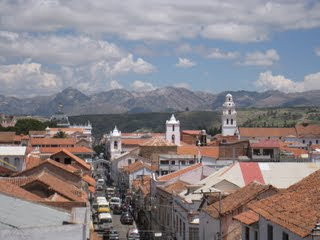 We are now firmly inside Bolivia and enjoying the balmy climate and somewhat laid-back vibe of Bolivia´s judicial capitol, Sucre. 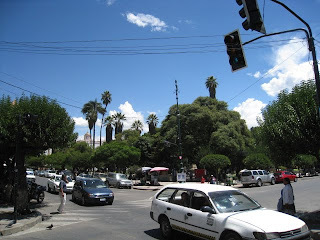 It´s quite hot here actually and much dryer than Lake Titicaca or even La Paz. This is a smallish and well-preserved colonial built city with narrow streets that bustle seemingly constantly with throngs of Students of all ages. There is a more prosperous feel here and the city has many private schools of all types. We are actually looking for some more schooling ourselves here as we hear that this is a good place to study spanish. This is a picture of something I´ve been meaning to snap for awhile. 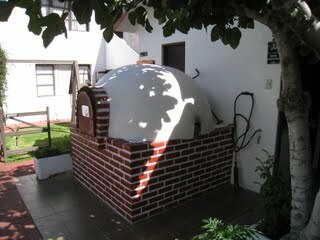 It´s a clay oven at a garden restaurant that we ate at yesterday that is typical of the andes and almost every restaurant we go to seems to have one. What this means is great baked potatoes, broiled meats, baked fish, and pizzas, lasagnas etc... Usually they are wood-fired and, from what I can gather, are a traditional Andean cooking method. When the results are this good, why buck tradition? Our hotel room has a kitchen so we went to the market yesterday and bought everything we needed for a good Quinoa soup which seems to be a staple down here. The markets here are an adventure unto themselves. I´ve never been to a market that is taken up 2/3 with it´s meat section. 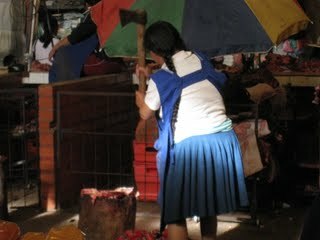 Check out this Chola whacking into a hunk of meat with a giant axe. As always, market trips are pretty challenging for people more accustomed to isles of pre-wrapped meatstuffs and sanitized deli-counters but the shock wears off eventually. We finally found a ¨supermarket¨ where we could get a few things we couldn´t find in the market, like soysauce, and that was as weird as the open market but in a different way. It was like shopping in a supermarket with about a third of the selection on it´s shelves. The dairy section consisted of various plastic bags of milk and yogurt with only a few brands represented. All the produce was wrapped in plastic. All in all this city is really comfortable and pretty. There are many old, colonial buildings and since it´s a university town there is a youthful vibrance and the primary tree-lined streets are well looked after. The main square is full of people of all types socializing and sucking on delish coconut popsicles in the shade of giant trees. Yeah, I think we are doing OK. I just left a comment on your Machu Pichu page. "What a time to be in Peru. I have had many emails back and forth from friends in the Sacred Valley (Terence is in phone contact with his close family there) who have been very impacted with the flooding. I was in circle last Saturday with dream group folks who are very well connected and we did ceremony for our Peruvian family. Our dear friends in Pisac besides dealing with houses floating, crops floating, loss of lives....... are challenged as Pisac is well known as a market town, and there has been no market in the last few months. Terence is heading down in two weeks and a larger group including Georgie with friend's Jim and Carol are leaving in a month. (these trips were planned pretty much last fall) I'm the only Dream Groupie that is not going. It has been interesting as 7 out of 10 of those who signed up for the trip are trauma counselors of one kind or another. Diasters anywhere are upsetting, and when you actually know and are in contact with those directly affected it is affecting. One of my favorite places is Ollantaytambo, love the photos Clay took. Yes a favorite place. it could give one itchy feet. I have been more immersed in the challenges and photos of such challenges and am being affected by all. I was amazed that you liked LIma...... of course for me it was at the end of my journey and I was sick and not much with going out anywhere except to the loo.